This easy-to-make botanical wreath will add a touch of elegant homespun charm to your holiday decor. With classic Christmas ingredients featuring dried citrus, you’ve got the recipe for a charming flower shop-worthy arrangement you can make at home. I don’t know about you, but the holiday season puts my domestic tendencies into overdrive. From baking, to decorating, to homemade gifts, I want to do it all. Sometimes my ambition is bigger than my ability and I only manage to tackle a portion of those Pinterest projects on my wish list. But, there’s one crafty thing I always make, and that’s a wreath. This year’s DIY Christmas wreath has an upcountry look highlighting dried oranges and florals and is pretty enough to be found at your local flower boutique. These steps are easily adaptable if you would like to customize the finished wreath with a touch of your own taste. Making a seasonal circle of fabulous to greet guests at the door or to hang festively from a window will scratch your holiday decorating and DIY itch. For an afternoon’s effort, using easy techniques, you’ll end up with a high-impact design statement. The outcome will be something personal that you can customize to complement your home’s holiday theme perfectly. Simple and stylish and signature. That’s awesome, right?! There’s no wrong way to make a wreath and the options are endless. To form your shape and foundation, you can use dried florals or vines, boughs, metal circles available at craft stores or even coat hangers. Your decorative details can take whatever direction you like. How about trying a natural and rustic look with a gorgeously-scented cedar circle base with pops of dried cranberries and pheasant feathers? Or, you could go glam. One year, I swirled metallic craft paint inside clear Christmas tree balls to create an artistic, glass-like finish. Then, with a glue gun the balls were affixed to a simple, metal circle. Christmas chic in no time. Perhaps the easiest one I made was a 5-minute wreath with bittersweet vine harvested from my back yard. The orange blooms on a woody vine evoked a wild and free arrangement that packed a design punch. Select your citrus of choice. 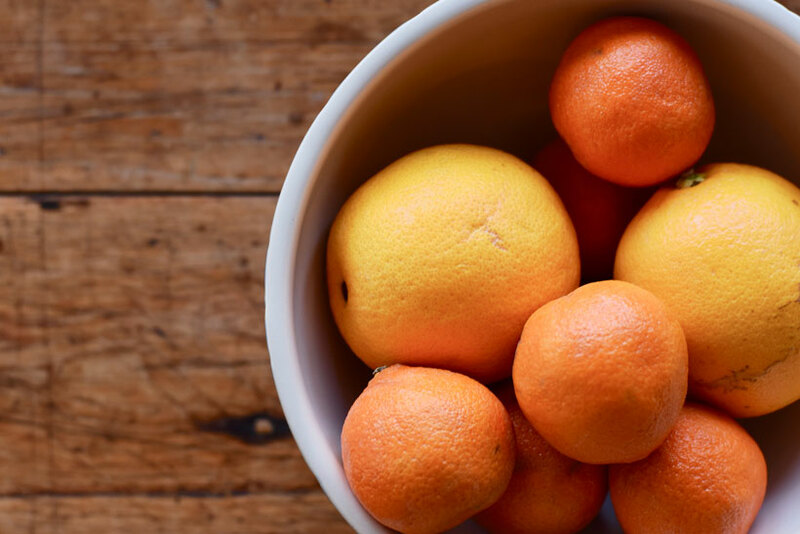 We worked with Christmas classics – oranges and clementines. You’ll need about six to eight in total. This is a great way to use fruit a little past their prime, so feel free to clean out the crisper drawer. 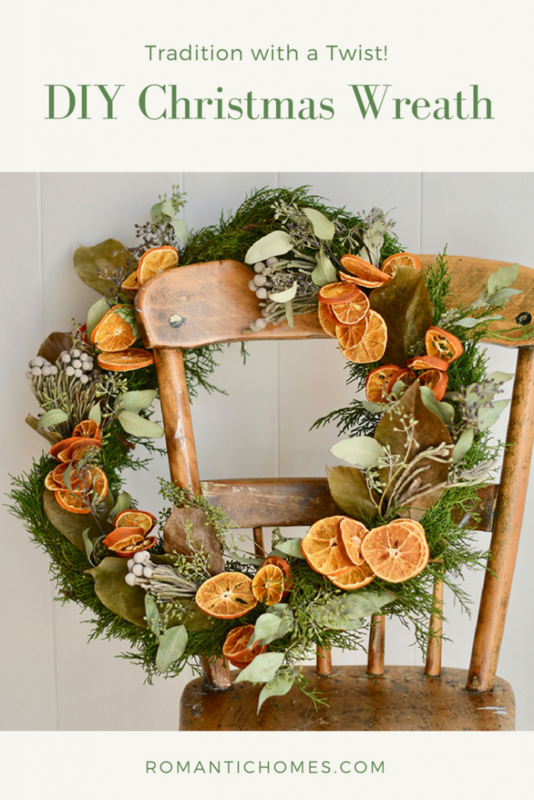 Traditional Christmastime fruits – oranges and clementines – are the fitting stars for this wreath. 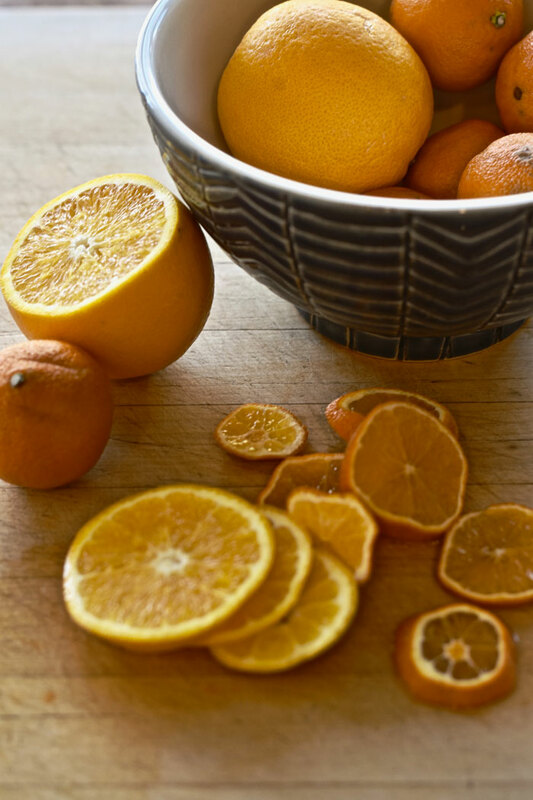 When sliced and dried, citrus turns into jewel-toned circles that are reminiscent of stained-glass windows. Scattered on a loop of juniper boughs with silver berries and seeded eucalyptus, you’ve got the recipe for a charming flower shop-worthy arrangement you can make at home. You won’t need more than an hour to assemble this botanical beauty but leave yourself at least four or five hours of oven drying time for the oranges and clementines. 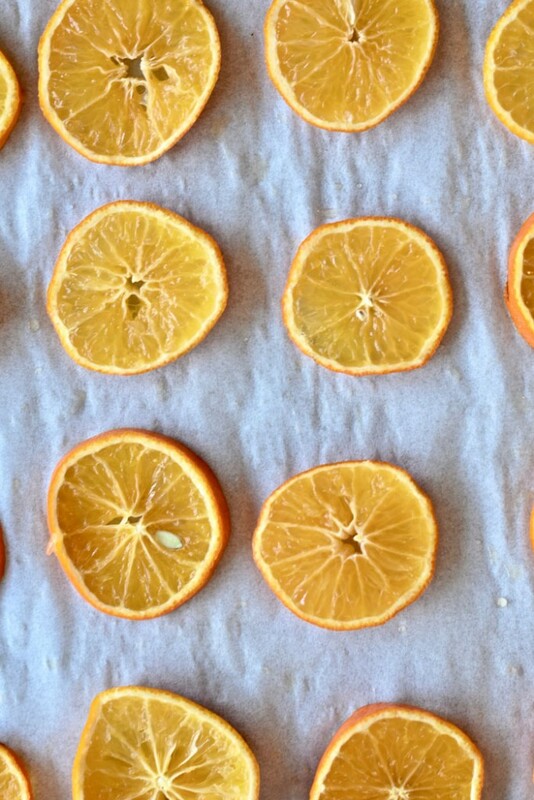 It’s a great idea to make some extra dried citrus circles. You can string them on twine or thin wire as a garland or put a ribbon through them to wrap around napkins for your holiday table. They also make lovely gift tags when threaded with string or yarn and attached to craft paper cards. 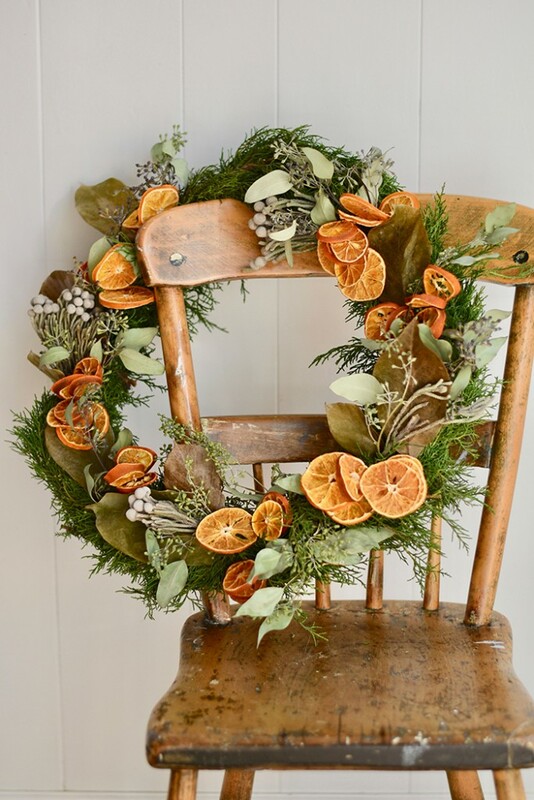 To make this wreath, you’ll need: dried oranges, evergreen boughs, dried floral bits (we used magnolia leaves, seeded eucalyptus, silver brunia berries), floral wire (or any thin wire will do) and snips. Cut the citrus in about one-quarter of an inch slices. Compost the end pieces that have the orange rind covering them. The variety in the sizes of the discs will add visual interest to your wreath. Line two baking sheets with parchment paper and lay out your citrus circles in rows. Bake in an oven at 200 degrees Fahrenheit for about four hours, flipping the fruit over at about the two-hour mark. Cut the citrus in about one-quarter of an inch slices. The variety in the sizes of the discs will add visual interest to your wreath. Pre-heat your oven as you slice. Line two baking sheets with parchment paper and lay out your citrus circles in rows. Bake in an oven at 200 degrees Fahrenheit for about four hours. 4. Make the base of your wreath with evergreens cut in 12-inch lengths. With some floral wire, attach your juniper boughs tightly together to form a circle. 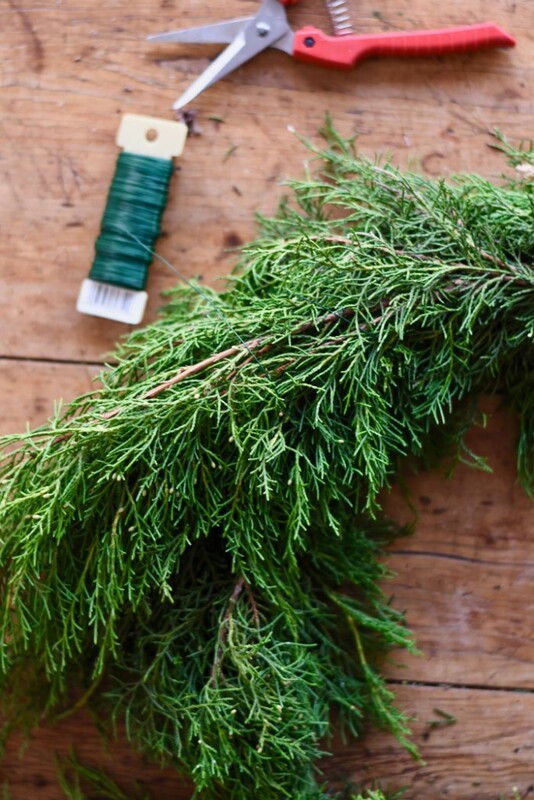 Make the base of your wreath with some lovely evergreens cut in 12-inch lengths. 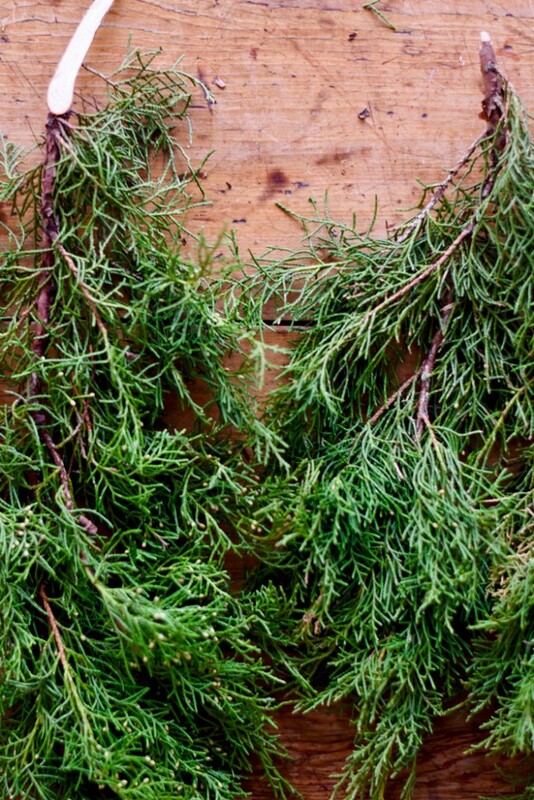 We’ve used juniper boughs (they smell gorgeous), but you could use anything you have on hand that’s fresh and pliable. The cuttings from your Christmas tree will work great too. 5. 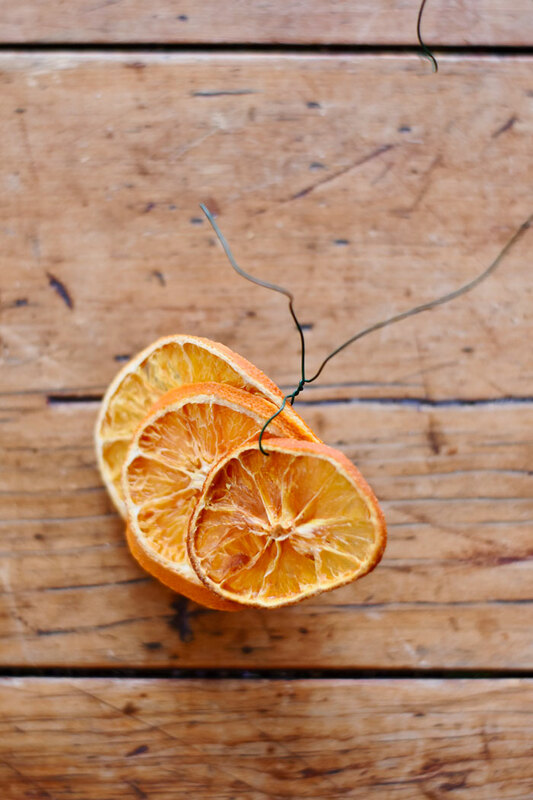 Using the floral wire, create dried orange bundles (each with three slices) by threading the wire through the circles. Leave enough wire on your bundles so you can attach them to the wreath. With some floral wire, attach your juniper boughs tightly together to form a circle. If you want, you can also attach the evergreens to a wire form or grapevine base for extra ease and stability. 6. Use the same process to make little bundles with the dried florals – or simply poke the dried florals into the wire that is holding the wreath together. 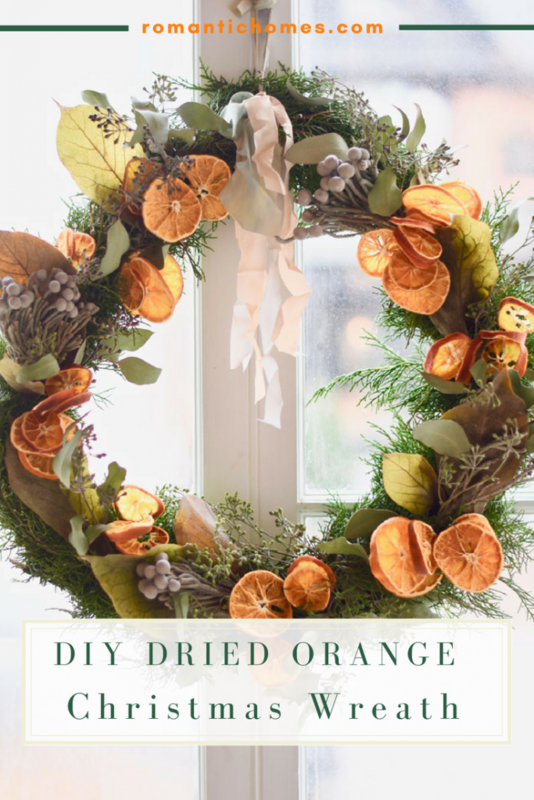 Using the floral wire, create dried orange bundles (each with three slices). Leave enough wire on your bundles so you can attach them securely to the wreath. 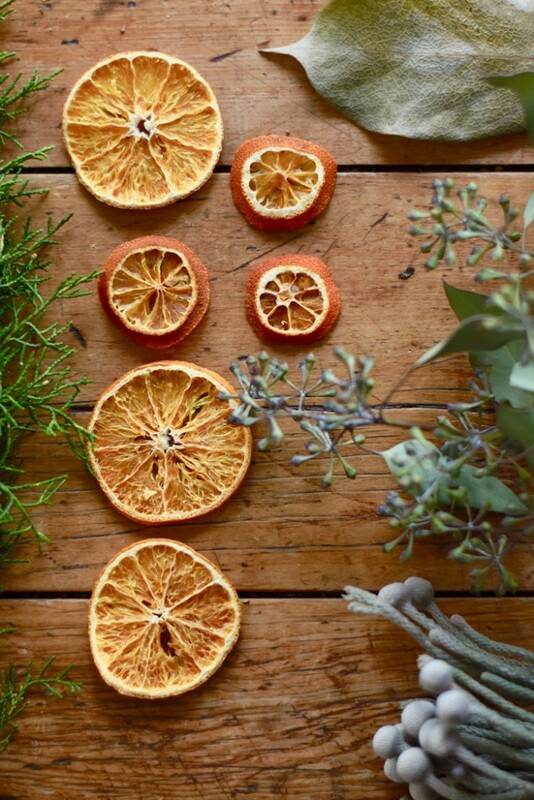 When you’ve placed the citrus slices, use the same process to position the dried florals and fill in the gaps. 7. 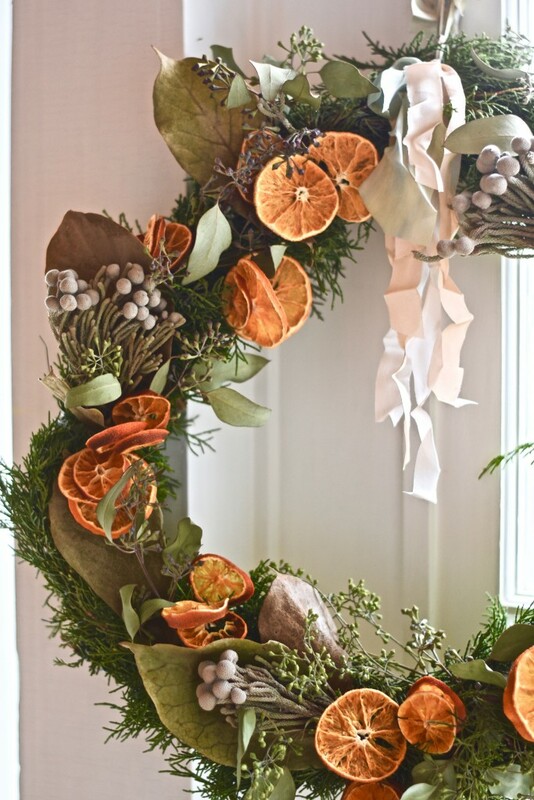 When you’ve finished positioning the citrus bunches, fill the wreath in with dried florals. Magnolia leaves, seeded eucalyptus, and silver brunia berries add texture to the wreath and allow the vibrant citrus to truly shine. 8. Finish off with a pretty silk ribbon bow and hang in a spot where the winter sunshine will illuminate the citrus slices. 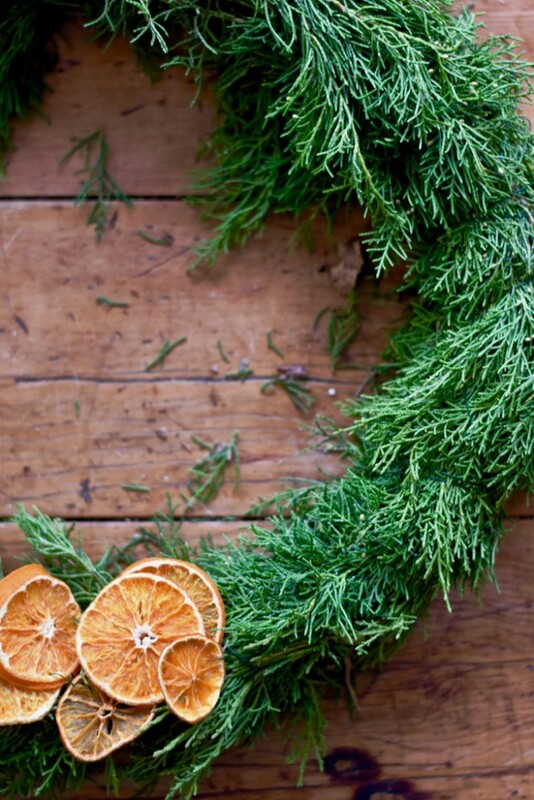 Finish off with a pretty silk ribbon bow and hang your new wreath in a spot where the winter sunshine will illuminate the citrus slices. Cynthia Zamaria is a floral designer, interior designer and an experienced renovator of historic homes. You can read about her current project, the Millar House, on her website and follow her design exploits on Instagram.